The almond custard and crisp buttery pastry complement ripe figs perfectly. The ingredients can be assembled fresh just before you are ready to start cooking. Preheat the oven to 200°C, gas mark 6. Slice the figs into thin half moon shapes straight from the fridge and leave them until they reach room temperature. To make the pastry, sift the flour into a bowl with the salt and icing sugar. Mix the butter in with a knife, then rub it into the flour until the mixture resembles fine breadcrumbs. Using a fork, work in the egg yolk with 1 tbsp cold water to make a soft dough. If the mixture does not hold together, add extra water, a teaspoon at a time. Stop as soon as the mixture forms a ball. Wrap the pastry in clingfilm and chill for 20-30 minutes. Cut the pastry into six equal pieces and roll out on a floured board to fit six 9cm loose-bottomed tart tins. Do not bother to trim the sides - just leave them flopping over the edge. Prick the bases with a fork and bake for 15-20 minutes, until the pastry is crisp and golden. Trim the edges with a sharp knife. In a small bowl set over simmering water, mix the cream with the egg yolks and sugar until the mixture is thick enough to coat the back of a spoon. Stir in the ground almonds and almond essence. In a small pan, melt the redcurrant jelly with 1 tbsp water. Spoon a little of the warm custard into the tart cases, top with sliced figs, decorate with redcurrants or pomegranate seeds, and glaze with the hot jelly. 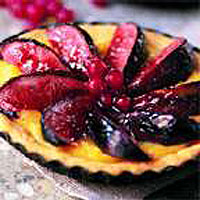 Serve immediately, while the tarts are still warm, with a glass of chilled muscat.